A luxury self-catering Villa with five spacious bedrooms, two lounges with French doors leading onto the garden with sparkling solar heated pool and Jacuzzi, two fully equipped kitchens and 3,5 bathrooms. The house is ideal for one large - or even two families. 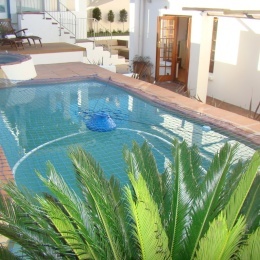 Situated in Hout Bay within walking distance to the beach, shops and restaurants. The Villa is very homely decorated with Colonial and African influences. You can feel the care and personal touch as you walk through this spacious home, every room is boosting with character. It consists of a main house (sleeps 6) and a cottage (sleeps 5/7). Sleeps 11 in total and there is even a sleeping couch to facilitate in total 13. The cottage and main house have an in-between door with a smooth flow as if they were one unit, yet both completely self-contained with the possibility of using separate entrances. Features include; fans, flat screen TV's (Satellite channels), DVD players, Hi-Fi CD players, WiFi internet access, games and quality beds with beautiful crispy bed linen. Dishwasher, washing machine and tumble dryer available in scullery main house. Both kitchens are fully equipped.